Drawing inspiration from the gnarled shrubbery of England's windswept moorlands, Brian Froud is best known for being the mad genius behind Jim Henson's film The Dark Crystal and illustrating such best-sellers as Lady Cottington's Pressed Fairy Book. In this volume, a long-awaited sequel to his international best-sellers Faeries and Good Faeries/Bad Faeries, Froud returns to the world of faerie with a wealth of new, never-before-seen paintings, watercolors, and drawings. Brian Froud's World of Faerie offers us a startling new vision of the magical realm, enhanced by Froud's own words about his experiences and insights. This lavish, full-color book opens the door to Brian Froud's wondrous imagination as never before. It presents beautiful portrayals of faeries that have touched hearts and minds for generations. 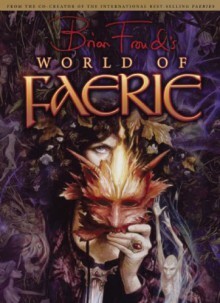 World of Faerie is by far Froud's most personal book, and represents this visionary artist and creator of fantasy worlds at the pinnacle of his powers. This encompassing volume is a must-have for faerie and fantasy fans of all ages, the world over.